Shackles broken, we can feel the heat rise palpably as we have joined in with our own “Hallelujahs” and our “amen” – silently, at first, then loudly proclaimed. We enter the second half the opening set – the liturgy of The Word, so to speak – Mr Sneed gives us the first glimpses of the voices in his chorale. With their glorious voices the music ascends to a heavenly realm: First, Anitra McKinney exhorts one and all to “Believe In Yourself”, the fervor in her voice coupled by its otherworldly charm brings the vivid lyric to life. She followed, a few rousing choruses later by Chanee Campbell who opens up a whole new sound-world with her exceptionally powerful rendition of a piece entitled “Home” the grandiloquence of her voice is matched by its bountiful energy. Mr Sneed also gives us our first glimpse of Alicia Peters-Jordan. With smoldering contralto she implores us to say seek our Saviour she ministers to us as if with the Word imploring us to believe with “Yes To Your Will”, a performance of utter grace with melody that floats and weaves with clarity, precision and feeling. Miss Peters-Jordan cedes the spotlight to the hair-raising tenor voice of Linny Smith. Mr Sneed, ever the immaculate accompanist, shows – as ever – a particularly clean set of fingers in his dashing virtuosity as Mr Smith’s vocals are acutely sensitive to word and situation, ascending and descending the composed and improvised parts of his vaunted song in operatic fashion, with meaning dictating structure rather than the other way around, as the greatest African American vocalists do. The sanctity of the evening assumes prominence once again as the repertoire becomes more solemn and yet more joyful. Mr Sneed, ever the watchful minister of the proceedings calls upon Alicia Peters-Jordan once again to proclaim “Love” and she does exactly that in a smoky voice that is deeply expressive and elegiac, and utterly convincing. That being done, Mr Sneed makes reference to the old blues in a magnificent version of “Call and Response”, echoing the Prayers of the Faithful in an otherwise sanctified setting and here he involves the entire Chorale while his beautifully imagined accompaniments emphasise the heavenly placations in the piano parts. It seemed like a perfect moment for Patrice Eaton to return to centrestage imploring “the faithful” with “If I Can Help Someone”, which when sung at full throttle ratchets up the dramatic tension in the room considerably to prepare, as it were, the way for The Lord. It is here that Mr Sneed reveals his “secret” weapon in the form of Markita Knight, who regales us with a prophetic version of “He’s Coming Soon” which is followed by “No Weapon Is Formed”. Miss Knight’s performance was one of the highlights of the evening. She revealed herself to be an artist of the first order. Her instrument was gorgeous: lustrous, precise and feather-light. 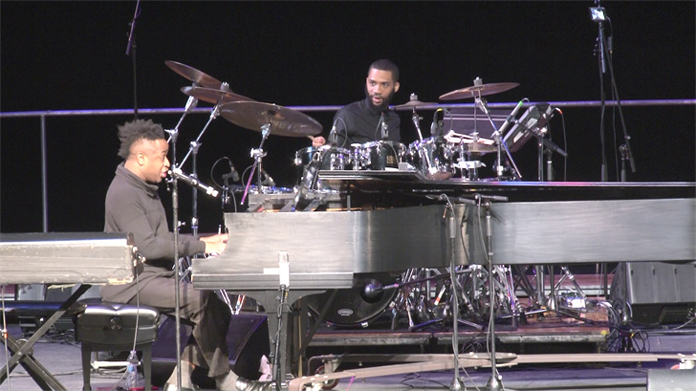 Her musicianship was fierce as she dug into the expression of each word, bringing ceaseless variety and breathtaking dynamics as she gave every phrase a special grace accompanied by absolute virtuosity by Marquéz Cassidy on the Hammond B3 organ. This seemed like a perfect time to bring back Linny Smith who brought his considerable vocals gifts and gilded tenor to an elevating version of “Broken to Minister”. Mr Smith once again sounded as singing was his most natural mode of expression, something that bodes well for decades of happiness as he most assuredly continues to grow into this wondrous repertoire that he already seems to have made his own. 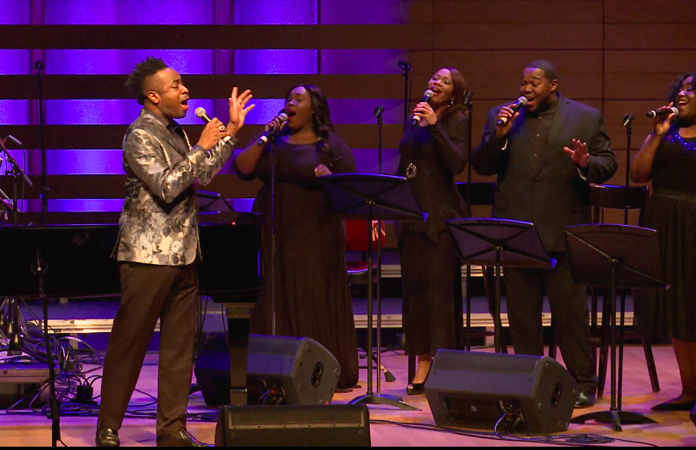 His last piece was also a call to Benediction before the final doxology in song which was provided once again by the inimitable Damien Sneed leading the full contingent of his Chorale and the Toronto Mass Choir, backed by a now-steaming trio of organ, bass and drums. The segment began with the invocation “Call Him By His Name”, which created a powerful atmosphere for the music to be raised heavenward with Richard Smallwood’s “Total Praise” and closed with the voice of Rev. Dr. Martin Luther King Jr.’s voice urging us to press on regardless of our seemingly insurmountable troubles and this gave way to a rousing, full-throated version of “We Shall Overcome”, a version in which every member of the audience was invited to participate in one of the most memorable recessionals you are likely to hear in Toronto for a long time. As Dr King promised and on the eve of his birthday we would return home believing that we had overcome.